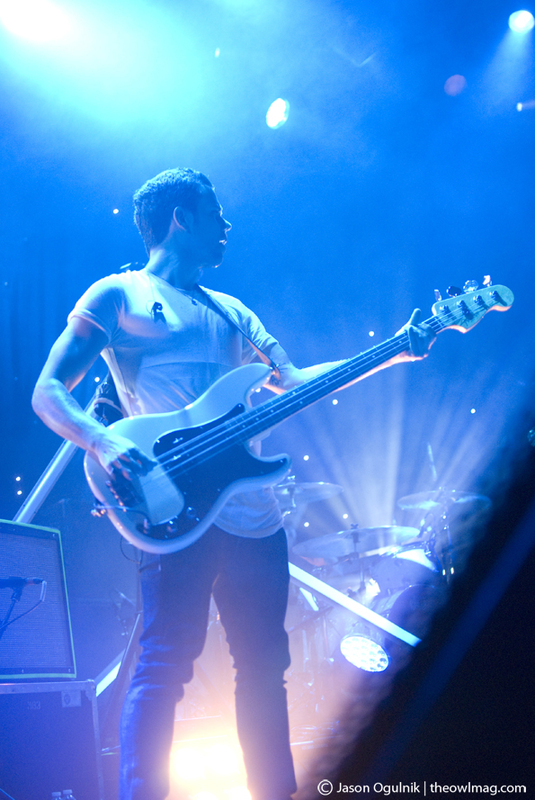 What is it about M83 that makes this band so universally beloved worldwide? Before the M83 show at The Fillmore in San Francisco, we sat upstairs looking down upon the capacity crowd at Sunday’s sold-out show pondering the answer to this question. 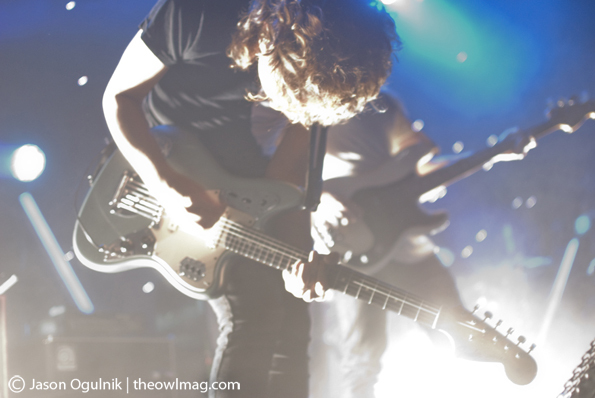 Compare M83 to any number of non-electronic based bands, say Arcade Fire for example, both equally loved but strikingly different in the way their music summons emotion to the surface. Bands like Arcade Fire do it through the lyrics and songwriting, but M83 does it by building and bending sound, then shattering the sum to create the emotional connection. Where Win Butler‘s vocals recall simpler times in a nostalgic tone, Anthony Gonzalez‘s vocals set the scene for you to live your everyday life to. 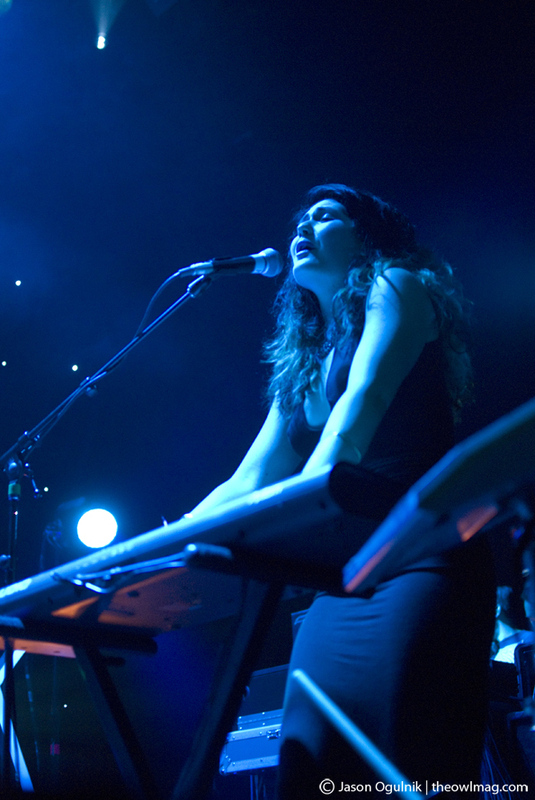 From the first buzzing synth, to the first strike of the floor tom, to Gonzalez crying out “Carry On, Carry On,” to the immediate harmonizing with Morgan Kibby’s gauzy vocals on “Teen Angst,” M83 introduced a wave of heart-thumping emotion to their adoring San Francisco fans. Transitioning to “Reunion,” Gonzalez’s vocals were as crisp and flawless as the album rendition in his characteristic sensual wailing style, almost like a breathless exclamation of pure elation and joy. 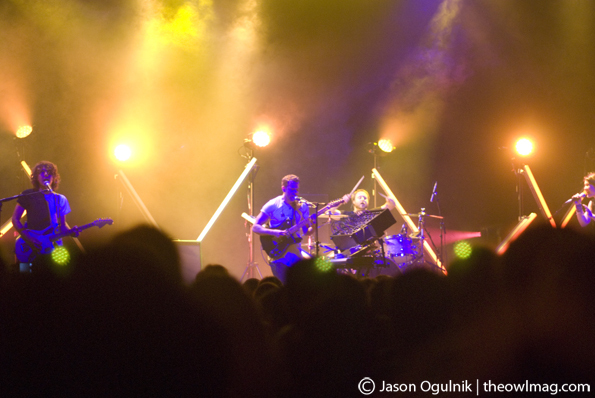 There was a definite cinematic quality to M83’s performances of “We Own the Sky” and “Wait,” not surprising when the band’s songs are often chosen to score films and television shows. As the band performed both songs, the musical arrangement revealed a movie-like format: the tense build-up and that sense of immediacy that paralleled the crescendo — almost as if the stage was being set for the protagonist in a film to make a pivotal decision leading them down the path they were destined for. 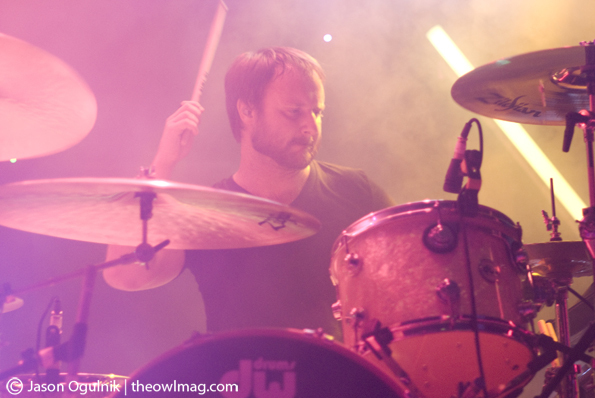 Though the life blood of M83 is the ever-present wall of synth-generated sound, what became apparent from the show was the critical role of the electro and traditional drum kits. Obviously a fundamental component in any band, for M83 the floor toms and crash cymbals truly are the pulse of the band beating jubilant life into the band. Without Loïc Maurin’s hard hitting drumming style, songs like “Steve McQueen” and the cover of Daft Punk’s “Fall” would have collapsed lifeless. After an hour and a half, our questions had a clear answer. The mass appeal of M83 is due to the fact that their music reflects all aspects of life. While you listen to their albums or witness a live performance, emotions that you never knew you felt about your life’s circumstances are coaxed out, placing you at the intersection of that exact moment of your life. 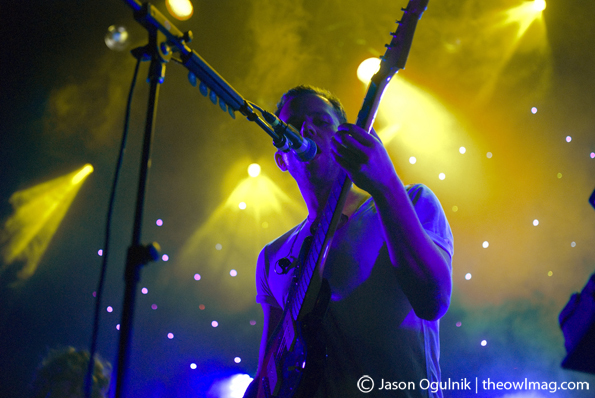 Check out even more badass photos of M83 here!